Time has got away from me again. I can't believe I used to blog almost every day. I'm not sure how I found the time! Felix saw the Surgeon last week in regards to the possible hernia he has in his groin. This Surgeon was so lovely, and after our awful visit with the Neurosurgeon a couple of weeks ago, it was a welcome relief. From the second we walked through the door of his office, he was all smiles and full of praise for Felix. He even asked if he could take a photo of Felix wearing his "Keep Calm. It's only an Extra Chromosome" tshirt! He thought it was great! 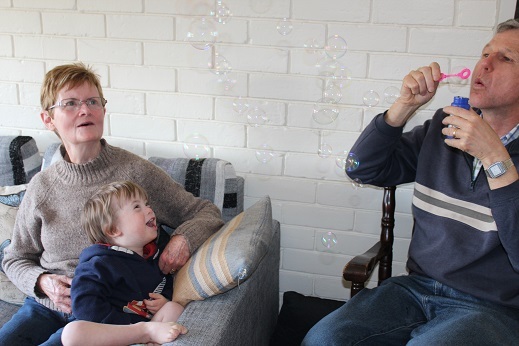 We met Felix's new Speech Pathologist this week. We had to go through a lot of paperwork, so Felix didn't get too much actual therapy this time around, but he made sure to use a lot of his new words. His new therapist was really pleased with him and is looking forward to working more with him the next time she sees him. Felix had his second lot of hydrotherapy a few days ago. I was glad to see he enjoyed it as much as the first time. Part of his therapy was balancing, while sitting, on a foam board. He did that really well, but the part that excited me, was when he wriggled to the edge of the board and threw himself towards me, into the water. He didn't wait for me to hold on to him, he just launched himself into my arms. I thought he was pretty brave considering he hasn't spent much time in the pool over the past year. We were excited to have my parents come up to stay over the weekend. Felix has learnt to say "Papa" and he says "ee" for Granny (Gran-'ee'). It was so beautiful to hear him wake in the morning and call out, "Papa...Ee" and go wandering off to find them. 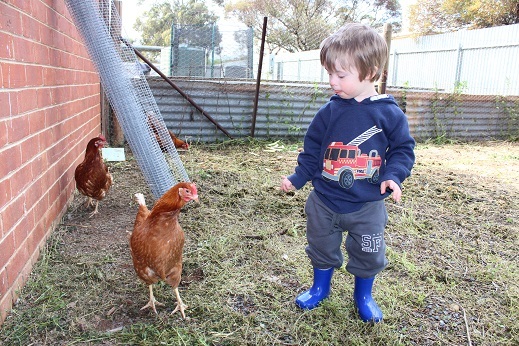 Felix enjoyed showing them the animals in the town, and taking them to see our new chickens, which he loves. They thought it was funny to see him walking around with the chickens, bobbing his head up and down, just like they do when they peck the ground. He's a funny little character. He is such a Papa's boy, and spent lots of time sitting on Papa's knee, reading stories and giving him cuddles. 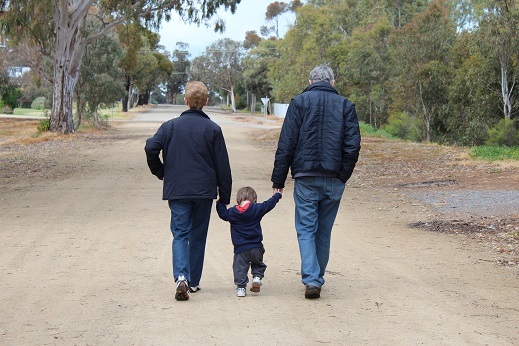 Mum and Dad both love going for walks so Felix was in his element. One of his favourite things to do is to go for walks, so he had a great time. 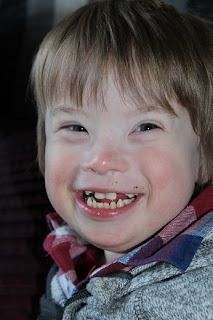 He giggled his head off when, at the playground, Granny kept following him down the slide! Great to hear the surgeon was a lovely one. Nothing worse than getting one who is not friendly or shall we say a little stuck up or not educated on our young ones.. lol.. Jaxon is being circumcised too. We have been on the surgery waiting list for a year now. Might give them a ring on Monday and see how much longer. I am always SO thankful when we have a lovely Doctor. They probably don't realise how much it means to us to see someone treat our little ones with as much respect as other children.